A hand sanitizer, or antiseptic, is often used as an alternative to hand washing when soap and water is not readily available. But not all hand sanitizers are created equal, and some may even cause health issues in children and adults. Manufactures claim that sanitizers kill 99.9 percent of germs. But some studies suggest that keeping environments too clean and the persistent use of antibacterial soaps and hand sanitizers may inhibit proper immune system development in children. This is because inflammatory systems require the exposure to common germs to properly develop. Although the FDA recommends, that when possible, it is better to use soap and water and scrub for at least 20 seconds, that is not always possible in the real world. So what about hand sanitizers, and can they be dangerous? There are new studies just out that are claiming that one ingredient used by some manufactures can indeed cause health issues. The ingredient is Triclosan. Triclosan was first registered as a pesticide in 1969. Triclosan is an antimicrobial active ingredient contained in a variety of products where it acts to slow or stop the growth of bacteria, fungi, and mildew. It is used in items such as conveyor belts, fire hoses, dye bath vats, or ice-making equipment as an antimicrobial pesticide. Triclosan is also used in products such as, fabrics, vinyl, plastics (toys, toothbrushes), adhesives, polyethylene, polyurethane, polypropylene, floor wax emulsions, textiles (footwear, clothing), caulking compounds, sealants, rubber, carpeting, and a wide variety of other products. Triclosan has been used since 1972, and it is present in soaps (0.10-1.00%), deodorants, toothpastes, mouth washes, and cleaning supplies, and is infused in an increasing number of consumer products such as kitchen utensils, toys, bedding, socks, and trash bags. So your morning routine may start with bathing or showering with soap, brushing your teeth with toothpaste and using mouth wash, perhaps applying some cosmetics, and a dash of deodorant. Then throughout the day, to protect yourself from germs, you use a pocket hand sanitizer, or spray. Have you checked those items for Triclosan? 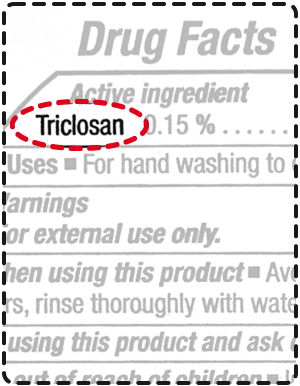 If the product contains Triclosan, it must be labled. Several scientific studies have come out since the last time the FDA reviewed Triclosan that warrant further review. According to one recent study, Triclosan may impact respiratory health, by promoting the development of allergies and causing inflammation in the mucous lining of the nose, also known as rhinitis. Researchers from NIEHS, Norway, and the CDC found the link after measuring levels of Triclosan in urine samples from Norwegian children. The authors published their paper online Nov. 12 in the journal Allergy, and state their findings replicate those of another study that used American children participating in the National Health and Nutrition Examination Survey. Since these reports found an association between Triclosan and the occurrence of allergic sensitization in two different populations, the researchers feel confident the relationship is genuine. 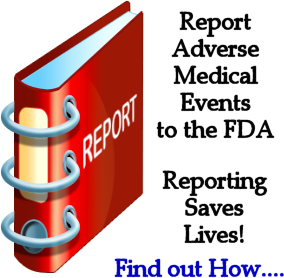 The 623 Norwegian children used in the study have been followed since birth. At age 10, the youngsters received two days of extensive clinical evaluation at Oslo University Hospital, undergoing allergy skin prick tests and lung function assessments on a treadmill, and provided urine and blood samples. The research team sent the urine samples to the Centers for Disease Control and Prevention to measure the amounts of Triclosan. The results showed that children with allergy sensitivity and rhinitis had the highest levels of Triclosan in their urine. Since Triclosan doesn’t stay in the body very long, 1-2 days according to the study, they think the elevated levels come from continued use of certain products. Animal studies have shown that Triclosan alters hormone regulation. Other studies in bacteria have raised the possibility that triclosan contributes to making bacteria resistant to antibiotics. The authors of the study plan to continue examining the Triclosan-allergy connection. They say other research groups have measured Triclosan in breast milk from Swedish mothers and, since Norwegian mothers tend to breastfeed their babies during the first 4-6 months of life, the study plans to follow up the Swedish findings with a study of Triclosan and allergy development in Norwegian infants. The research team has already collected urine from the newborns and will follow up as they age. The FDA has partnered with other Federal Agencies to study the effects of Triclosan on animal and environmental health. 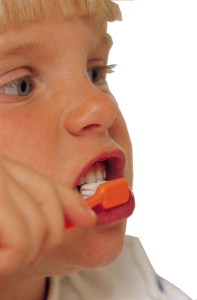 Check the labels for Triclosan on the items you and your children use. Many hand sanitizers, like the PURELL® brand, do not contain Triclosan. Using alcohol based instant hand sanitizers, when soap and water are not available, is one of the Centers for Disease Control and Prevention’s recommendations. The Centers for Disease Control and Prevention have recommended the use of alcohol-based hand sanitizers when soap and water are not available and hands are not visibly dirty. The CDC recommends that children in school may use alcohol-based hand rubs as an alternative to handwashing. The main active ingredient in Purell hand sanitizers is ethyl alcohol, the primary germ-killing agent in most hand-sanitizing agents. According to the Purell company, one of the major benefits of using ethyl alcohol over other germ killing agents is that bacteria have been unable to create a resistance to ethyl alcohol. That means that regardless of how often you use the product, the bacteria continue to die. Isopropyl alcohol is also a germ-killing agent. Although the percentage of isopropyl alcohol is much less than ethyl alcohol, both work together to keep your hands free of the bacteria and viruses that cause infection and disease. Carbomer is a common ingredient used to make gel-like solutions. The carbomer is added to water in Purell by sifting it in. As the carbomer combines with the water, it creates a non-foaming gel. Tocopheryl acetate is a form of the fat-soluble vitamin E. It is commonly used in skin products as an antioxidant and moisturizer. Its moisturizing properties can help offset the drying effect that ethyl alcohol can cause to the skin. Glycerin is another common ingredient in skin products. It works in two ways–as a skin moisturizer that absorbs moisture from the air, and to make Purell easier to spread on the skin. Propylene glycol is a moisturizer that works similar to glycerin. This ingredient pulls moisture from the air and deposits it into the upper layers of the skin, helping to keep skin from drying out. Isopropyl myrisate works to thicken the consistency of the Purell gel. It also acts as an emollient to prevent the product from feeling oily. Non-alcohol, or some labeled ‘natural’ sanitizers are not as good. Alcohol-based sanitizers work because alcohol breaks up bacterial proteins and kills them. In the end, know your ingredients, read labels, and choose wisely.